Niçoise salad (salade niçoise) is known throughout the world. Unfortunately, despite its success, the authentic and traditional Niçoise salad is only known by a minority of people. 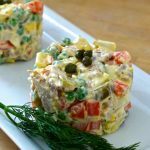 Some say that cuisine must evolve and recipes must adapt and change, but for many purists, a real Niçoise salad must follow certain rules and also avoid some pitfalls. 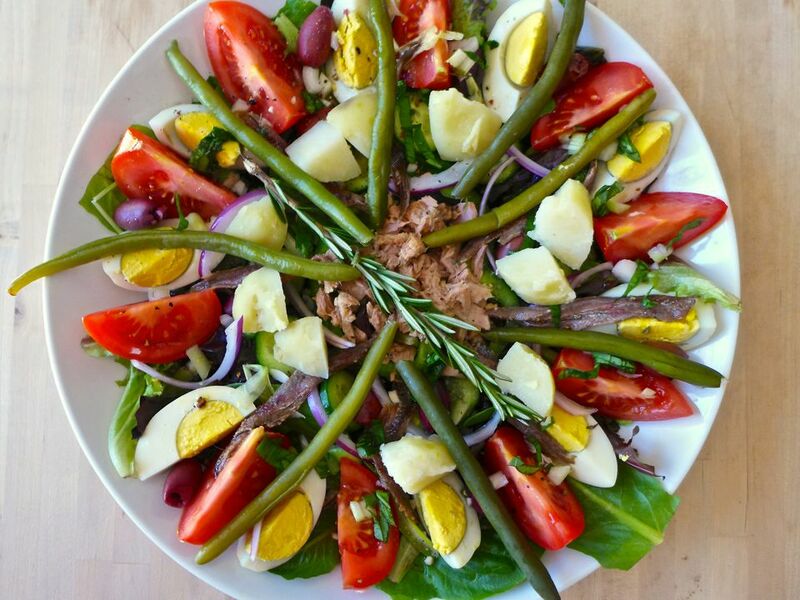 Niçoise salad is originally a poor man’s dish prepared exclusively with affordable local ingredients. The dish was served to fishermen upon returning from their outings. 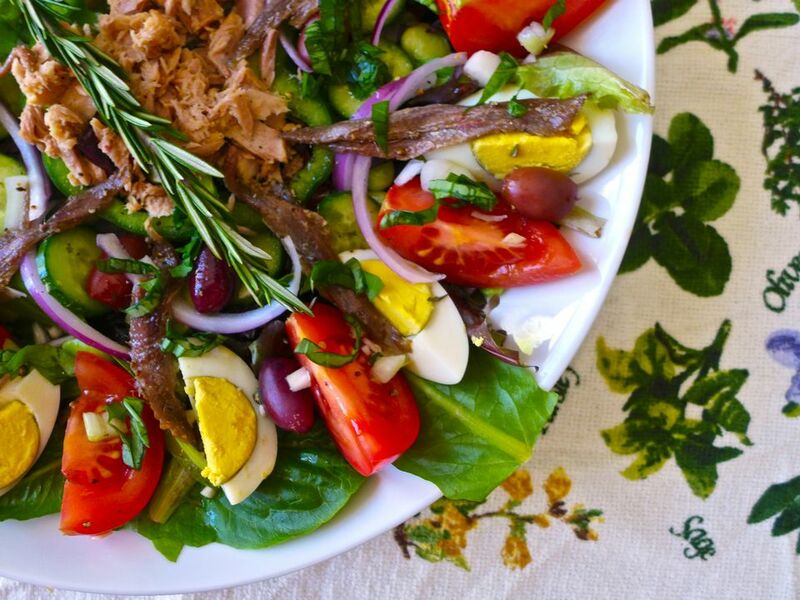 The ingredients that appear in all the traditional recipes of Niçoise salad include tomato, hard boiled eggs, spring onions, small unpitted black olives (from Nice) and canned tuna or anchovies. This salad being a poor man’s dish, only one fish would appear. It was either tuna or anchovies. Nowadays, the use of both in the same salad is commonly accepted, even by purists. Also, there are variations of the Niçoise salad either with fresh seared tuna or with canned tuna in olive oil. 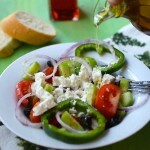 There are several versions of the salad depending on the neighborhood, families or regions it came from. 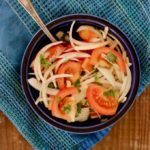 Some include other local ingredients such as small fava beans, cucumber, bell pepper (red or green), radishes, raw baby purple artichokes, celery heart, red onion and more importantly mesclun. Mesclun is a salad mix typical of the South of France. Indeed, mesclun (from the Provence word mesclum which means mixture) was invented by the monks at the monastery of Cimiez (Franciscan Fathers) in the beautiful city of Nice. The composition of traditional mesclun may include mâche, lettuce, chicory, arugula, escarole and radicchio or even baby spinach, purslane and dandelion. This salad mix should include at least 5 salads for the name mesclun to be used. 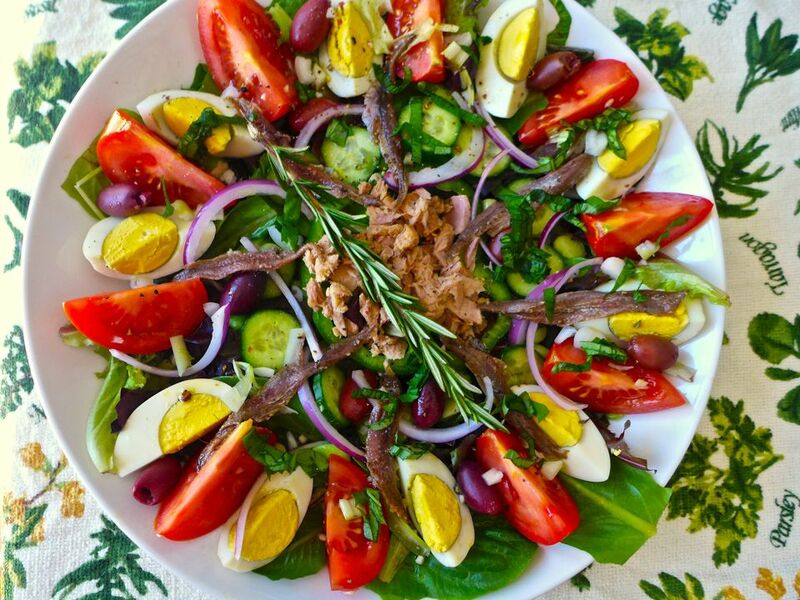 How to make an authentic niçoise salad? So what mistakes shall a novice make in order to annoy a Niçois? 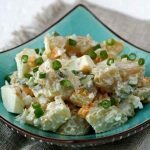 To start with, the rookie mistake is to include cooked vegetables, either green beans or potatoes. As a matter of fact, a picture of fake Niçoise salade has made it to this post somehow. Can you identify it? Then, there is no rice in a Niçoise salad. I do not know who started to include rice in this salad but this is still a mistake that some people do. Also, the fish used in the French salad is either tuna or anchovy. No other fish. Not even herring or sardine, even if sardines are quite used in Nissarde cuisine. 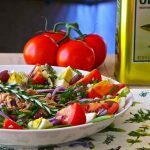 What dressing to use for Niçoise salad? 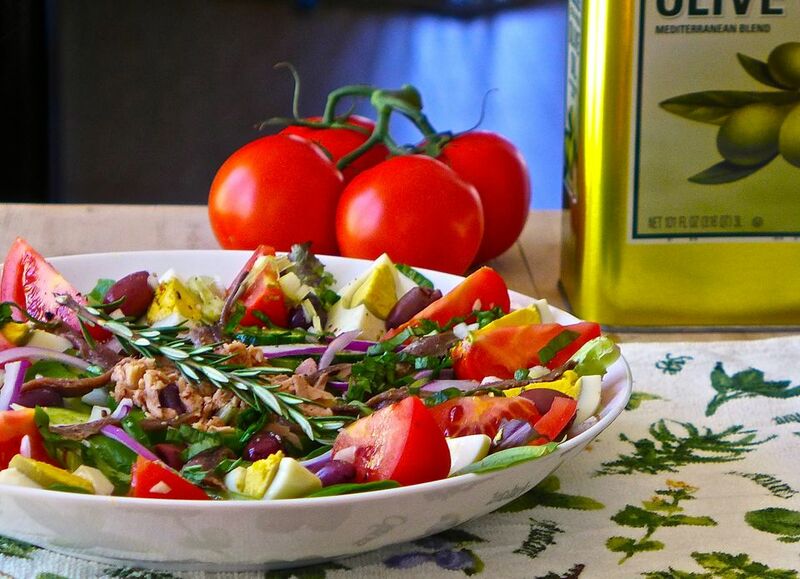 Many people only use olive oil, salt and pepper as a Niçoise salad dressing. 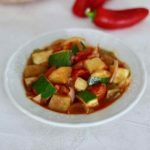 Traditionally, vinegar is used to season the salad only when it is served in a pan bagnat, typical Niçois sandwich featuring all the ingredients of the salad in a round soft bread. It seems that the use of vinegar is now tolerated in traditional Niçoise salad. However, mustard is apparently banned! It is not always easy to find typical ingredients from Nice when you live in Los Angeles, so I adapted the salad niçoise recipe a bit to try to stay as close as possible to the original authentic recipe with some very minor substitutions such as Kalamata olives instead of small black olives from Nice, lima beans in place of baby fava beans and classic green bell pepper instead of the Corne de Boeuf elongated variety. At home, it was a festival of colors and flavors. 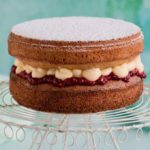 Probably one of the most photogenic recipes of our world tour of flavors! The traditional recipe of Niçoise salad include tomato, hard boiled eggs, scallions, unpitted black olives and canned tuna or anchovies. In a bowl, prepare a vinaigrette with the olive oil, vinegar, rosemary, salt and pepper. Rub a large plate with garlic. In the plate, place a bed of mesclun. Arrange tomatoes, boiled eggs, cucumbers, green peppers and tuna, anchovies, olives, spring onions, fava beans. Pour the vinaigrette on top and garnish with basil. Simple mais si bien presentee ! appetissant ! Bravo ! You got the recipe all wrong. Red onion? Vinegar? Basil? NEVER. That is NOT how it’s made. Thanks so much Barbara! You too. Do I live in Nice? No. Do I care what they put in their salad? No. Do I really believe that French housewives never vary their ingredients by one iota? Adamantly, no, I don’t believe that! I don’t like tuna and therefore use salmon instead. I don’t like olives and my kids don’t like anchovies so I leave them out. I frequently use (gasp!) bottled dressing to same time. The result is ALWAYS delicious. Geez, make the damn salad according to what you and your family enjoy eating, people, and don’t stress out over how authentic or inauthentic it might turn out. Skeezix, there is absolutely nothing wrong per se with making salade niçoise with bottled dressing or like some in the US, with seared Ahi tuna. 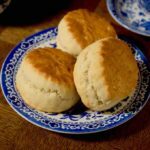 The whole point of our website is to focus on traditional and authentic recipes and food history. 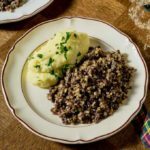 There are thousands of other sources for revisited and modern versions of all these recipes out there. And I am sure all of these recipes are just as delicious. 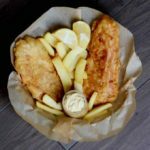 We just happen to focus on authentic recipes. That’s all. Enjoy! Agreed! 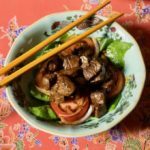 Yes, although whatever is delicious to the cook and their family and friends is perfectly ok, it is fun to research and cook AUTHENTIC versions of recipes. 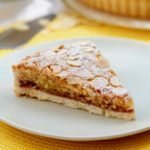 Classical French Cooking is pretty well defined. Regional has a bit more leeway. Michael, thank you for your contribution to an authentic version of Salade Niçoise. Thanks so much for your comment, Eileen. We are all about authenticity! I grew up in Southern France, and ate many salads nicoise. They always include tomatoes, green peppers, cucumbers, potatoes, onions, olives, anchovies, tuna, lettuce, eggs. Now, since I live in US many people don’t like anchovies, so I leave them out. I alternate between tuna and fresh salmon…Some people always use fresh green beans as well. I have to say “authentic” is a joke. 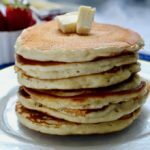 No AUTHENTIC recipe uses canned tuna they use seared. I love the traditional Nicoise Mike, there is nothing I like better than to get as close to traditonal as possible.